Our Scholarship work includes an exciting variety of projects in which we work in partnership with organisations across the education sector. In this work we aim to benefit individual young people and also to support our partners in developing their understanding of what works in widening access to education and raising attainment. Towards the end of 2018, we created a hub page for this widening access work and we're confident this will blossom into a useful resource over the coming months, housing all content we share relating to these projects. The nurturing of young talent by developing confidence and resilience is at the heart of our work and that of our partners. One theme that runs through this is that of mentoring in various forms. We support the work of MCR Pathways, who describe in their latest impact report how their mentors work with care-experienced young people in schools to give them the support and encouragement they need to reach positive destinations in employment and further and higher education. 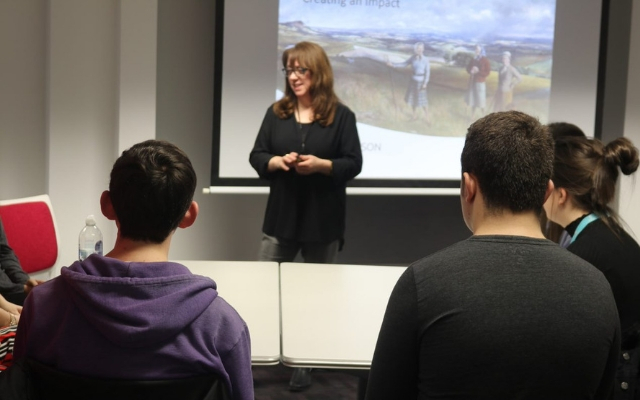 Our collaboration with St Andrews University and Fife College, First Chances, provides academic skill development and mentoring from university students to young people from P7 to S6 in schools in Fife. We also help to fund the Social Mobility Foundation's work in Scotland which includes employers mentoring and providing work experience to S5 and S6 pupils. We support mentoring programmes with Borders College and Forth Valley College, where the focus is on helping young people in danger of disengaging from education to remain in school and make a successful transition to College courses. The Transitions to Learning and Employment programme at Glasgow Kelvin College addresses a similar theme through a youth work approach, allowing young people who have dropped out of school to attend the College and work towards employment or a college course. The use of approaches such as mentoring emphasises that every learner is unique, and needs to be supported in a way that works for them. Mentors can be matched to young people to ensure that their experience and skills will be a good fit for the person they are supporting and it's the personal attention and encouragement that can make the difference when facing barriers to success. An increasing number of young people from the projects we support are making the transition to university supported by our Journey to Success programme. As well as financial support and a range of career development activities (including internships and career pathways) our Robertson Scholars form a peer support network, where older Scholars provide support and mentoring to the new intake each year. In many cases, former Scholars now in employment are able to provide internships and mentoring to current Scholars. All this is in addition to our dedicated team of Scholarship staff who are always available with support and advice, and can help direct Scholars to support available from their own universities as well. As we develop our Scholarship work we are keeping in view the need to provide support at all stages of the learner journey if young people are to overcome the barriers they face and achieve their potential. We hope that by continuing to work with an increasingly wide range of partners we can play a small role in the development of a truly equitable system of access to education. January also saw the restart of our workshops for current first, second and third year Robertson Scholars across the country. These workshops run throughout our Journey to Success programme and have been devised to help scholars maximise their potential at university and compete successfully for graduate level jobs. Current topics include Creating an Impact, Building Personal Resilience, Brand Credibility and Career Networking. Do you want to find out more about our Journey to Success programme?